Learn how to work around the crochet chain! Learn how to join a different yarn, with a single crochet, to your work. This technique is very useful when you want to add a different color to the beginning of a row. You don't need to chain in the beginning of that row which gives it a smooth edge. Have you used this technique before? Did you like it or not? Learn how to change colors seamlessly in the middle of a row! Preparing for Halloween? Here are six spooky buddies you can't celebrate it without! These crochet buddies will keep your valuables safe while you're out trick or treating, no one will dare to look inside! All have a zipper to ensure that nothing falls out, and, apart from Frankenstein, all have two compartments to help you keep more organized! They are 13x9cm (5.12x3.54 inches). Today we are making kitty's cute face, the ears, the legs and tail! 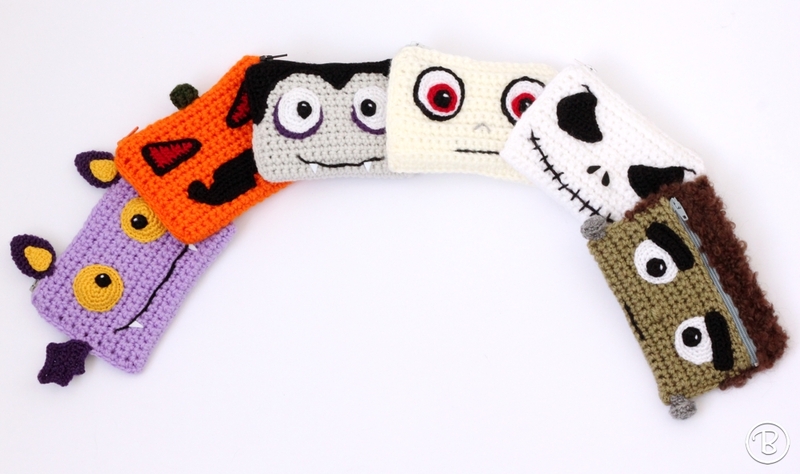 These past few weeks I've been working on my new crochet project: Buddy Wallets - Spooky Edition. Learn how to work in the back loops only! Working in the back loops only allows you to add texture to your work in a very simple way. It's a very useful technique to know to create amigurumi shapes that need sharp corners! This technique can be used with all crochet stitches! Learn how to secure your crochet work so that the fabric doesn't unravel! The needle join is also known as invisible join, to learn how to make it check out the video below! The needle join is great for pieces worked in spirals because it's almost invisible and it leaves a smooth edge. Learn how to work the treble or triple crochet. The treble, or triple, crochet is a taller stitch than the double crochet, works up quickly and creates as open fabric. To increase work more than one stitch in the stitch of the previous round or row. This technique can be used with any crochet stitch! Learn how to make the invisible decrease. The invisible decrease is a neat way of turning two stitches of the previous round or row into just one stitch in the round or row you are working on. The invisible decrease is almost impossible to distinguish from the other stitches, it doesn't leave gaps or bumps and creates an even work. Learn how to make the extended single crochet (esc). This is my favorite crochet stitch to use when making clothes for my amigurumi! The extended single crochet is a variation of the single crochet. It has double the height of the single crochet and a texture that reminds me of knitting. The extended single crochet creates a closed fabric that drapes nicely.